The game comes out in a week and it promises to be amazing. Have you pre-ordered yet? If not, why? No. Don't really see the point. There are no pre-order bonuses, and I can't even get a good deal for it shipped on launch day because it launches on a Sunday. Same with Zelda. I'll wait and see if any retailer has a good deal with the game. If not, I'll just head up to Gamestop. No, because I really have no reason to do so, there's no pre-order bonus that I'm aware of. My plan next week is to go to the store and buy the game! No, because I never pre-order anything, I like waiting till the week of and finding the best deal. Speaking of, I wonder what the best deal is going to be. Should go check and see if any deals are coming out yet. Super Mario 3D Land for 3DS (reg. $39.99) will come with its own $15 gaming coupon for all SYWR customers. K-Mart is actually rocking it with deals lately, they're like the new Amazon (who is oddly slacking.) Now, hopefully they have the damn game. They never got in Kirby. Hell yeah. I would have done it from Amazon, but this is a game I don't wanna wait for the shipping for. Plus I wanted the pre-order bonus from Gamestop which is a Tanooki Mario Key-chain. There's a pre-order bonus if you reserve at Gamestop. 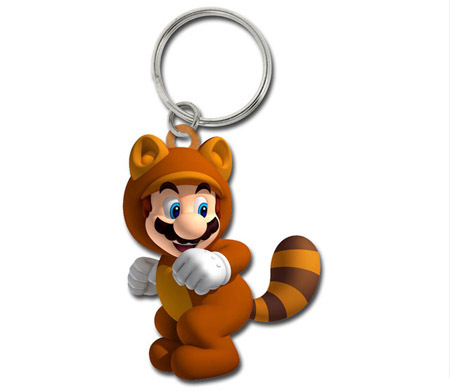 Anyone who hasn't pre-ordered it yet should check out the Tanooki Keychain bonus at Gamestop. Well I think K-Mart and its $15 gift card are the way to go, but did you guys know that Gamestop is offering a keychain? Nope. I did pre-order REvelations from Amazon while it was still $40, though -- I don't plan on getting a 3DS until that comes out, but I'll probably get Mario shortly after that. I seldom preorder games. I did for Zelda just to ensure the bundle, though I'm sure there will be lots available anyway. Maybe I will preorder for this keychain. I've preordered it at Best Buy, along with Zelda and Mario Kart, because as a Reward Zone member you get $10 worth of points per game. In Canada, anyway. Not sure about the US. This. I pre-ordered this and Mario Kart 7, in-store pickup too. I haven't pre-ordered yet, but now that I have some money to spend, I will. That keychain will be mine! I'll put it on my desk or something. Mrs_Mustache reserved it the other day. Woo!, Tanooki Poop Key Chain! Bah, apparently EB Games here in Canada only has an offer if you buy both Mario Kart and Mario 3D Land from them. You get pins for both games. I think I'll just pick the games up at Walmart on release. No keychain for the handheld hater! I haven't preordered. I don't think I'll have any hassels getting a copy. It releases the same day as Skyward Sword here (which I did pre-order), so I'm planning to pick up a copy of Mario at the same time. Pre-ordered at Gamestop because of the keychain (and because that's the only bonus anywhere). Don't think it'll be hard to find, but I may as well get free things. Ditto. By the way, what's your avatar?